This beautiful tri-level home is situated on the west shore of Cross Lake - part of the Whitefish Chain. It is approx. 4600 sq. ft. and features an open floor plan with a large loft, 4 bedrooms each with it's own bath, and all the amenities you could possibly want. There are beautiful granite counter-tops in all bathrooms, kitchen and bar. It has a gourmet kitchen with 2 sinks, 2 dishwashers, 2 ovens and a 6 burner Viking stove; a Home theater/Entertainment room ( 8 ft. projector screen) with pool table; baby grand piano (Baldwin); flat-screen TV's throughout; two independent surround sound systems; 2 gas . fireplaces; a full bar area with sink, fridge, clear ice maker, dishwasher, and microwave. Relax and enjoy the breathtaking view from the deck or spend a beautiful evening, sitting by your own private fire-pit that overlooks the lake. During the day the lake is the place to be. You'll have your own sandy beach for catching those ray's and a large dock for storing your boat. We also offer our 25 ft. pontoon for an additional $1,750 per week. A vacation spent on Cross Lake will give your family a memory that you will cherish for a life-time. Don't pass this up. Please note: The minimum rental is one week and the maximum persons allowed is eight. large kitchen with 2 full size sinks, 2 dishwashers and a 6 burner gas (Viking) stove. We stayed for 2 weeks, second year in a row. This is an Architectual Digest type property. 5 star for luxury travelers. For a lake home, even has a theater room with bar & pool table, gourmet kitchen. Owners are fabulous and accommodating people, will return as this is not a "Cabin" at the lake! Our group of friends had a wonderfully relaxing stay in your fabulous home. We've stayed in some choice spots, but this ranks among the best. The home is well-appointed and spotless with a sweet lake view and access. Loved hearing the loons with our morning coffee. The walking/running trail is lovely when dry, and the pool table and big screen perfect when it's rainy. We definitely plan to make a return visit! This lake home is top shelf - the owners have thought of Everything!! The photos don't lie - this home delivers on all levels - location, amenities, comfort, cleanliness, and beauty. 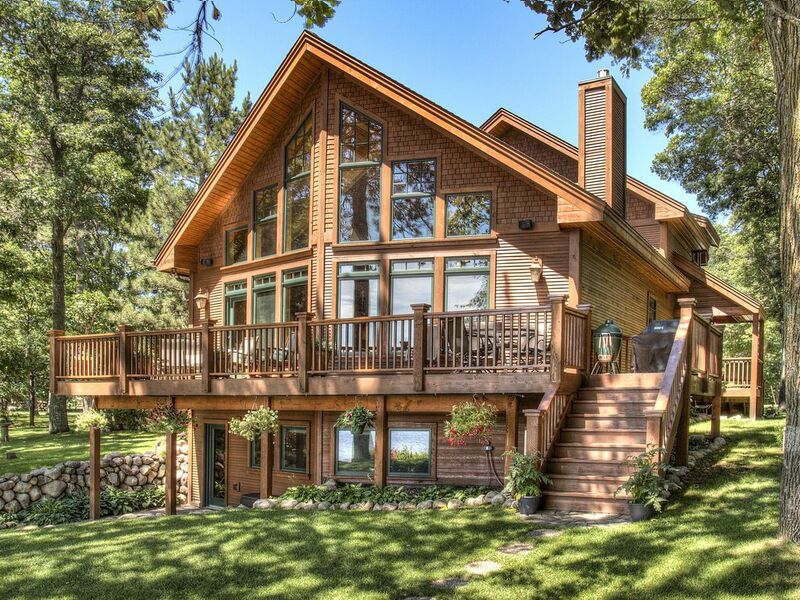 Located three hours north of the Twin Cities - it's absolutely perfect for a couples/girlfriends/guys weekend, small group retreat or family getaway. There are four bedrooms, each with its own bathroom (Master has a king, two bedrooms have queens, and one bedroom has twin beds). The home theater projection screen is Amazing for watching sports, movies, and concerts - seriously, it's like you're there! The gourmet kitchen is fit for a Top Chef - absolutely everything you need to prepare scrumptious meals and then gather around the table to savor them. Two fireplaces, a pool table, a piano, and a cool loft area that overlooks the main floor. The view is Spectacular - don't miss watching the sunrise over the lake and listening to the loons while sitting around the firepit or on the beach - um, yes, there's even sand! Oh, and tennis courts are right across the street - BOOM! Rob is delightful to deal with - he sincerely wanted to provide us with a fantastic experience. There are a few restaurants in Crosslake if you want to eat out/carry out, and Pequot Lakes is pretty close for shopping excursions, but once we landed - we didn't want to leave. We will definitely be back!! There is a $2,000 non-refundable deposit PER WEEK of stay to hold your reservation. Beautiful 25 ft. pontoon (includes electric lift) available for rent -- $1,750 (plus tax) per week.